January 9, 2007: LTTE defenses continue to crumble, and the organization is regressing back to a terror group, rather than a rebel army. The LTTE is losing control of more territory each day. Suicide bomb attacks are meant to stir up ethnic strife, that will make Tamils angry enough to support the LTTE again. That does not appear to be working, as nearly 600 LTTE fighters have surrendered so far this year. January 8, 2007: In the east, a major LTTE camp was captured by the army. There, they found a truck loaded with explosives, and rigged to be used as a truck bomb. This was apparently intended for a major attack in the capital. January 6, 2007: Another LTTE suicide bomber, apparently female, attacked a bus 85 kilometers south of the capital, killing eleven, and wounding up to fifty. January 5, 2007: An LTTE suicide bomber attacked a bus outside the capital, killing five and wounding nearly fifty others. January 4, 2007: The army and air force continue their attacks on LTTE targets in the east (where the LTTE is rapidly losing control) and the north (where the LTTE is more powerful.) 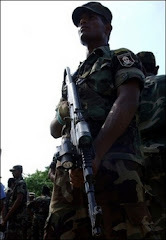 LTTE losses for December were some 2,200 killed, and many more wounded. LTTE is having a hard time recruiting new people, and has been relying more on coercion. This, however, produces troops of uncertain quality.